Basketball is not just a sport at RIET, it is a culture of it's own. For all badminton loving folks of RIET. Come be a part of the Institute Board Games! Ever dreamt of playing in an environment as you watch in premiership football? 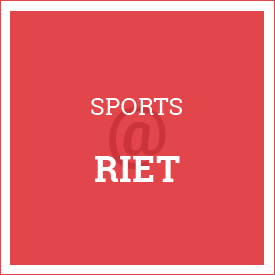 Basketball is not just a sport at RIET, it is a culture of it’s own. There is a robust community of basketball players who enjoy and practice basketball all days of the week! The institute men’s and women’s teams have shown exemplary performances at Sports Meets and also in the local circuit in Jaipur time and again. For all badminton loving folks of RIET. It has been one of the most active clubs handling the most active sport in the institute. With promotion of Badminton as its true motive, it has organised a wide range of events in its first year of inception itself. This year its gonna be bigger and better. Headed by the Badminton Secretary and driven by the conveners, Badminton Club will be one of the most happening clubs of the year. Let’s take the game in the institute to a higher level. Ever fancied playing in a state of the art, fully air conditioned table tennis court which you get to see in the Olympics? Look no further! We strive to portray table tennis as a sport with absolutely no prerequisites with a massive number of people picking up and excelling in this sport every year with the guidance of a dedicated coach and our team players. Headed by the Table Tennis secretary and driven by the conveners, Table Tennis Club promises fun to everyone who is a part of it. Let’s take the game to a higher level. Institute Board Games cater to all who want to learn any kind of Board Games. We envision to take our Board Games culture to a renowned and established level of sport. Being indoor we have an opportunity to serve the students all 365 days. Board Games is not for the lethargic but for the enthusiastic. Come be a part of the Institute Board Games! Ever dreamt of playing in an environment as the ones you watch in premiership football? This being the most followed and played sport in the institute along with the state of art facilities available at your disposal, Football at RIET surely contributes to making your stay at the campus memorable! Besides, our coaching facility is groomed to an altogether another level where you learn to develop your style of play professionally, regardless of where you start from. Together, lets make this excellent sport flourish even further and take it to new heights!